New York Times best-selling author Mary Jo Putney delights readers with lush historical romances like The Wild Child (RB# 96158). In her first contemporary novel, she tells a searing story of family, love, and desire. Kate Corsi's lifelong dream has been to work for her family's world-famous explosive demolition business. Her stubborn father denied her this dream until he died. Now, his will has promised Kate a fortune-but only if she can live for a year in the same house with her ex-husband, Donovan. As Kate and Donovan form an uneasy alliance to learn the truth about her father's mysterious death, they must confront the wrenching secrets of a past that nearly destroyed them. And they must face the perils of moving too close to the burning point, where their passion could once again catch fire. 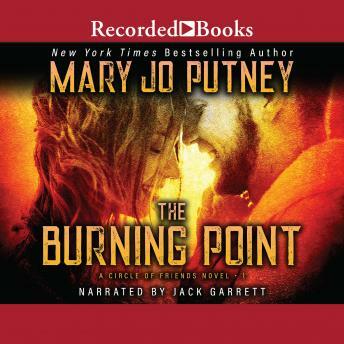 Filled with compelling characters, The Burning Point solidifies Mary Jo Putney's position as one of today's great romantic writers. Jack Garrett's inflamed narration will leave listeners smoldering.